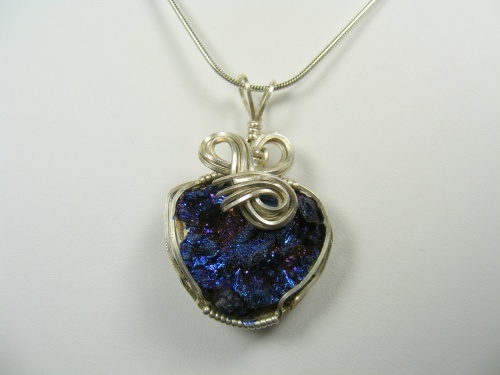 This beautiful dark navy blue titanium druzy gemstone, is full of sparkles and unique beauty. If you turn the stone around you see the outside of the rock. Glistens in all colors of the rainbow. Sculpted in sterling silver curls and swirls. A raw beauty that will never always be the talk when you wear it. Piece measures 1 1/2" by 1" for those of you who like smaller more petite pieces and, comes with a sterling silver snake chain.